Our rocker's seat and back conforms to your body. The all-wood seat and back feel like a quilted cushion because of the lively support of interlocking blocks that are suspended through the frame with nylon rope. As a result, you will relax in exquisite comfort. Your back will love it! The arms are designed with knitting and holding babies in mind and the placement of the arms makes getting up easy. The frame is constructed of solid hardwood. Joints are mortise and tenon, and will not loosen. The frame is compact and strong; the forces created when in use actually pull joints together rather than causing stress to the joints. The rockers provide a gentle, even movement, which gives you a secure feeling as you rock back. The frame tapers from bottom to top and from front to back for balance both visually and physically. The rope is a light brown nylon, 5/16" thick, very strong, far more than necessary. The weight test is 2000 lbs. My first rocker shows no sign of rope fatigue after more than 30 years. The rope is strung very tight, and will give in just slightly, like breaking in a shoe, after which it will remain firm and flexible. 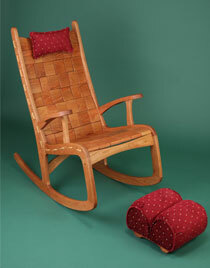 The rockers are made out of hardwoods: Cherry, Red Oak, Bird's Eye Maple or Black Walnut. All woods are selected for their beautiful grain, color and durability. None are stained so that the natural color of the wood in all its beauty comes out. We are happy to send wood samples upon request. 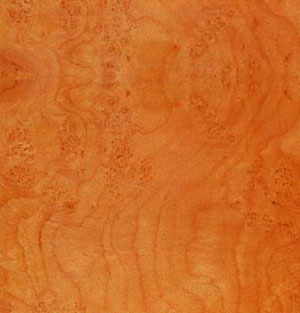 The Cherry is a reddish-light brown color when new, and in a couple of months will darken to its characteristic red-brown color. Red Oak is a light tan color and mellows with age to a golden tone. Bird's Eye is a light honey color with lots of sparkling eyes. Black Walnut is a dark brown with a tinge of red after aging for a few months. We offer two sizes; the Regular and the Tall-Wide. The Regular rocker is designed for people of all sizes and is comfortable for people under 6 feet tall. same as the regular rocker, floor to seat, front to back, height and placement of the arms. The frame and blocks are dipped in a linseed oil finish, which hardens inside of the wood as well as on the surface. The linseed oil has been heated but not boiled, so it is non-toxic and smells good. The chairs receive several more coats as they are hand-buffed to a soft, smooth finish. Carnuba/beeswax finishing wax is applied as our last step in the finishing process. 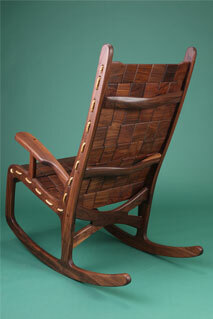 The finish becomes smoother and glossier as your rocker ages. 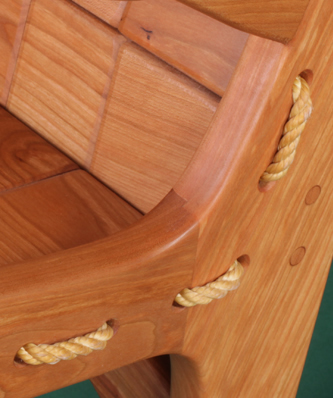 Our goal is to make furniture of the highest quality so your Vermont Folk Rocker will last generations. With constant inspection during the process of construction and assembly, joints fit with detailed perfection. 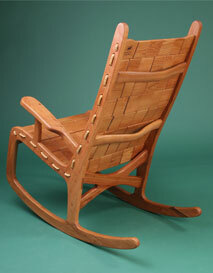 The high degree of craftsmanship results in a well-assembled frame, a very comfortable seat -- a beautiful rocking chair. 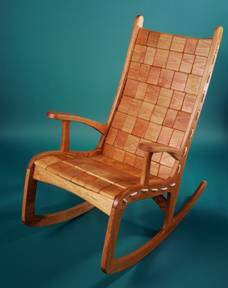 We have built hundreds of pieces of custom furniture over the years, with the best of everything distilled into the Vermont Folk Rocker. 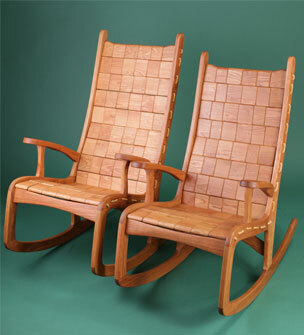 Each chair is signed and dated by the designer, Jim Geier. For a small charge, we can add a brass plaque engraved with your message to commemorate a wedding, retirement, or other special occasion. Included with your rocker is a neck pillow with your choice of fabric color. We also offer matching footstools designed to nest underneath the chair when not in use. If looking for a table or bench that matches the wood of your chair, we’ve got them too. With every rocker we sell, we include a Care Kit. The kit has directions for maintenance, as well as a supply of our oil-and-wax finish, fine sandpaper and a buffing pad. If you need an additional kit, we sell them individually for $10. For detailed care instructions click here. Simply, give us a call and we can help you figure out what chair is best for you and you can find out what is in stock. A $100 deposit is requested to reserve your rocker. Then, it can either be shipped directly to you, or picked up at the shop. Full payment is due when the chair leaves the shop. See our ordering page for more details, and please call if you have any questions. Copyright 2017 Vermont Folk Rocker. All rights reserved.